Three SMS students are returning home with a lot of new hardware after competing at the 2018 BC Summer Games in Cowichan, BC, which took place from July 17 – 22. Grade 9 student Jamie Harker did not disappoint and achieved her goal of taking home gold medals in all four of her events. The young triathlete, who often competes against girls much older than her, showed the competition that she is a fierce competitor. Jamie has a very bright future in the sport of triathlon and we can’t wait to see what the future holds for her representing SMS and hopefully one day Canada. Grade 12 student Maelle Reed just turned 17 but she already has an impressive rugby resume. She can now add BC Summer Games gold medalist to that list of accomplishments as her team brought home the gold medal. Even more notable, she scored a try in the championship game helping her team to the top of the podium. Maelle is on the Girls Provincial rugby Elite Team that was recently competing in Las Vegas. Other accomplishments include making the U18 team that will be going to England and being shortlisted for the U18 Youth Olympic team. 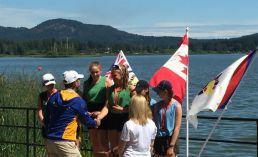 Grade 10 student Nina Corwin has become accustomed to winning medals in rowing, and the Summer Games were no different. Nina and her partner Mira Calder (whose father is a four-time Olympian and silver medalist) took home the gold in the women’s doubles, as well as a bronze medal in the quad and a bronze in the skills competition. The Vancouver Island-Central Coast region took home the most medals overall with 145, 58 of which were gold medals. We could not be prouder of our students who are amazing representatives of everything SMS stands for and our vision of creating confident girls and inspiring women.